The above shows global trade through September 2011 (with almost full data) and preliminarily through October 2011 (based on only 20 out of 71 countries that have reported so far). This is based on the monthly data from the WTO (and see here for more methodological detail). This data is a bit tricky to interpret since there is clearly strong seasonality and yet it's such a short series, and with such a giant anomaly in the middle from the 2008 recession, that straightforward seasonal adjustment methods are unlikely to give good results. Accordingly, I have marked with a green oval the August-October period in each past year to assist visual comparisons of different years. You can see that normally at this time of year there's a big surge of pre-Christmas trade, with the exception of 2008 when the financial crisis overwhelmed it. You can also see that this surge is completely absent this year (red oval) - there is a small downturn in September/October instead. The caveat would be the preliminary/incomplete nature of the October data. 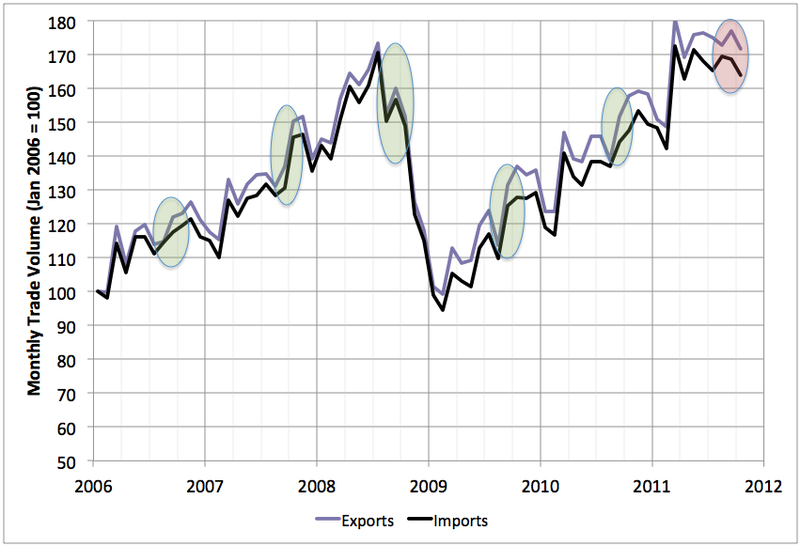 However, I take the fact that imports and exports show a very similar pattern as evidence that the sample is large enough to capture the main trend at least roughly (it's almost the same set of countries reporting in both cases but since countries typically import quite different things than they export, the two measurements sample world trade in quite different ways). I take this as more evidence consistent with the view that the world is in the early stages of a recession triggered by the European debt crisis. Thank you, as always. For "downtown" read "downturn?" Stuart, it is interesting that the price of oil roughly corresponds to the value of trade. Of course, container traffic has fallen a little as well. The US entered recession in 2007 and container traffic started to decline at that time. Yet global trade measured in dollars surged as shown in the WTO data. You can see from this WTO press release from 2010 that the 2008 surge in global trade was due to a surge in trade between Europe and Africa/Mid East. This has to be almost entirely oil price related. 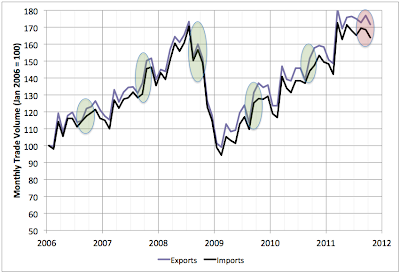 The question then is how much of the softness in global trade in late 2011 is just softness in the price of oil? Kenneth: haven't had too much chance to explore the internals but it does seem noticeable that Chinese exports fell quite markedly in Sep/Oct. To follow up on the observation that the a recession is likely to be caused by the European debt crisis, it is perhaps not coincidental that this debt crisis, like the US mortgage finance crisis, follows an oil price shock. Like a family that can manage a heavy debt load until a big financial shock comes along, economies will do the same. One has to wonder whether the Eurozone would be under this much stress with Brent at $30 a barrel. Perhaps not. The day of reckoning could perhaps be delayed by several maybe even many years. Germany which is being aided by a very cheap Euro. Oil alone represents 15% of global trade with Brent at 105 dlrs, right? Global trade is around 15 trillion a year, trade in oil is around 65 mbpd, that gives us 2.5 trillion a year. But if the price of oil goes up 25% to $131/bbl., that makes the oil trade 3.1 trillion dlrs a year and 20% of world trade. World trade seems to have gone up 500 billion or 3% to 15.5 trillion dlrs, but what has changed except the price of oil? The value of oil to world trade together with price volatility due to resource constraints seems to be creating large distortions in the trade data: such as a phantom trade boom in 2008 during a recession. Of course, there is also the anomaly of measuring world trade in US dollars. This makes world trade seem to boom when the dollar is weak, such as in 2008 and contract when the US dollar is strong. The correlation between the oil price and the value of world trade seems to come in part from the fact that we are measuring both in US dollars which are themselves fluctuating in value. If we measured trade in a "basket of currencies" we could get rid of some of the dollar fluctuation issues but we would still be left with the oil price fluctuation issues. Hmmm. That's certainly a very interesting question worthy of further study. One would need a story about how the transmission went for say Italy (I think Greece was doomed regardless of oil prices for sure). In Italy one could argue that disruption due to Libya was a factor, or worsening of balance of payments due to increased oil prices. Another story might be about the ECB not needing to tighten if oil prices hadn't risen and pushed inflation up. Not sure how much attribution I'd posit myself at this point. I guess I'll add that my mental model is very much that we are in an era when oil supply is constrained and if the economy was healthy demand would grow rapidly, so in every recovery oil prices are going to grow rapidly until they become a problem for the global economy. Eventually something will give and cause a slowdown/recession. In some cases the thing that gives may have been almost ready to go by itself anyway. Or it may not and it may take a huge oil price shock to push the necessary adjustment. This latest situation seems a little more like the former than the latter. If you draw three regression lines for pre-recession, intra-recession and post-recession, and subtract the trendlines to leave the seasonal variation, you'll see better.